To be touchable and findable. On my 31st birthday, my best friends from all over the world piled into my little brown house by the sea in La Jolla, California. 31 doesn’t seem too important in the grand scheme of notable birthdays, and truthfully, it’s not. My friends love me (that’s what friends are for), but they hadn’t come for me. They’d come for we. For the exploration of re-villaging, for the remembrance of belonging, for the touch of flesh in a digital world and the feeling of breath on soft skin by candle light. One late Monday afternoon, after the dancing, after the festivities, after the kitchen was clamored with dirty dishes and our hearts were beginning to reveal their more tender truths, we’d set up the living room as a make-shift recording studio and Matt and Jodi played each other their songs like friends who’d known each other for all of time even though they’d met only days before. We’d never sung this song together. I’d never read the words on those pages. But there we were, stumbling to touch the truth of the moment, to let it touch us, to feel something honest in our shaky humanness, to both shield and reveal our mortal vulnerabilities, our needy muscular longings, our unbreakable desire to make something real and beautiful together out of this wild world that always always breaks us, if only just before it re-creates us. To be touchable and findable, David Whyte writes. To be one who lives up to the very fierce consequences of being bodily present in the world. And isn’t that really what we want? Underneath all our defenses and avoidances, technological take-overs that tear us from our flesh? To be touchable and findable? To take the consequences? To want warm arms against warm arms, the soft remembering of gentle smiles eye-to-eye, the ability to be broken, each of us just mere tender longing love puddles hidden behind pretty social media squares? I don’t know about you, but I want more music in my living room and more weeks forgetting to take a picture or even check my phone. Sending so much love your way, as well as a hefty invitation to invite more real life magic back into your life. It can start with a digital detox paired with a plan for fleshy togetherness. What’s your heart crave? Put it on the calendar. 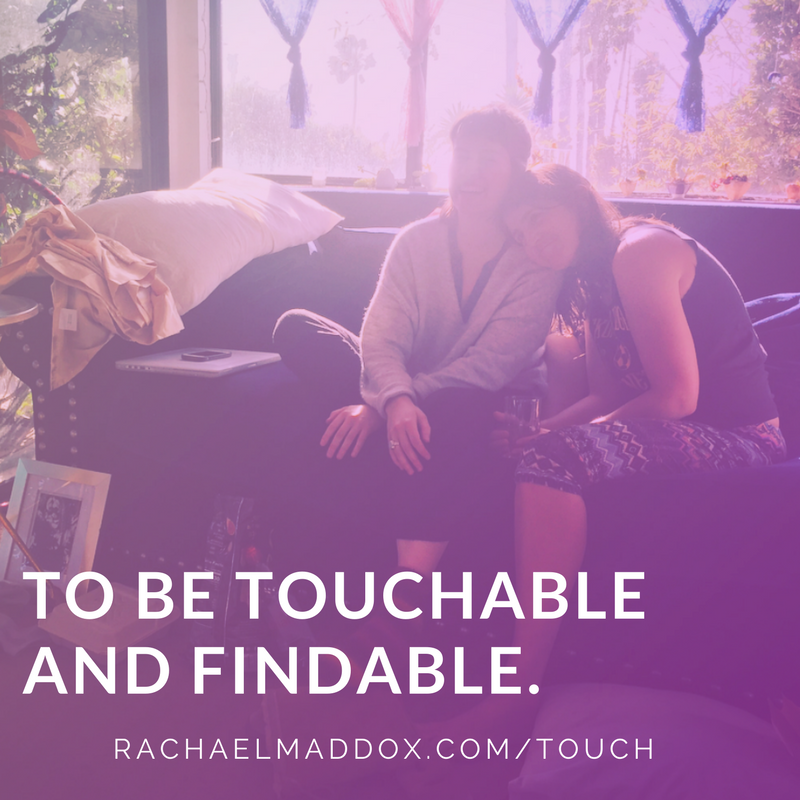 To being touchable and findable by the ones you love the most.